Drums are the oldest living instruments on earth. They were around when people as a society were still young and lived close to the land. Their vibration helps us tune into the natural frequency of the earth, connecting us to all that is. Native American Drums are an age-old tradition, First Nations / Native American Indians have been making drums on the American Continents for millennia's. Combining animal and plant life to make an instrument that rings not only through the air, but across time. All the elements of Nature are used in the creation of the drum, representing the circle of life in all its aspects. Many First Nations / Native American Indian traditions were and are passed down through the drum songs. Big East Native, Hand drums sound great for all First Nations / Native American Indian songs that we have tried ourselves. These include pow wow songs, traditional ceremonial songs, social dances, and free styles. 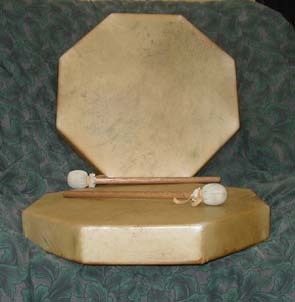 North American pow wow singers use drums like these for hand drum competitions, ceremonies, and just for fun. In Continuing the Art and countless hours of determination, we have come up with a drum that not only looks good and plays well, but also has a good feel. These drums truly reflect the Tribal Sound that we hoped to achieve. We use only the highest quality North American elk and buffalo hide and have chosen the sacred eastern White Pine for frames as it is such a powerful tree. All the wood is locally cut and milled from the Finger Lakes region of New York State. 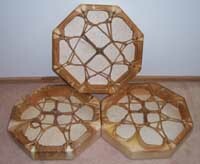 <Read Legend> Each frame is solidly joined together without the use of any glue, and hand carved and finished, producing a sturdy frame, that won't come apart, even if submerged underwater. We use a sturdy lacing, which is individually cut by hand for each drum. Our drums are definitely one of the best values out there for their price.